Agents of the Nigerian Army has since 1966 till date, attained a high record of genocidal activities perpetuated against Biafrans. The trigger-happy outfit has recently added to its list of genocides, yet another record of brutal killing of over 2000 Biafrans and still counting, while others have been declared missing by IPOB. The recent Amnesty International Report on the Nigerian army's barbaric use of unnecessary force and life bullets on peaceful and armless Biafran protesters is not a surprise, as Biafrans have been faced with far worse situation in the hands of Nigerian security forces than was reported by Amnesty International. The Nigerian Army which enjoys 90% composition of soldiers from the Hausa/Fulani ethnic group, has been an easy tool of oppression, malignment and subjugation of Biafrans right from time immemorial. From the three years pogrom (Biafra-Nigeria War) to the recent kidnappings, maiming and killing of Biafrans, the statistics of casualty recorded has dangerously skyrocketed to nearly 6.2million. The Army has been engaging in the game of downplaying the sacredness of Biafran lives forcefully taken by them at no slightest provocation. Though the “downplaying” tactics worked for them for quite a long time as they were backed by Britain, U.S (under Obama administration) and Arab nations. Realities on ground has proven that the obsolete antics of these evil conspirators and killers of Biafrans is colloquial, revealing and full of animosity. The Nigerian Army's morale in advancing her ethnic cleansing on innocent Biafrans has heightened due to the deafening silence and nonchalant behaviour of the International Community who should have, in strong terms, rebuked and condemned Nigeria's genocidal war crimes against Biafrans; it is unfortunate that they are only interested in the bounty derived from shared Biafran mineral resources and not bleeding human resources. The Nigerian government till date, still cannot believe that the recent turn out of events and exposure of her atrocities against Biafrans could be solely investigated and made open by Amnesty International. The Amnesty report is only but a minute detail of Buhari-led government's evil; a fall out of his mischievous and gruesome perpetrations against the most “endangered human species,” the Biafrans. 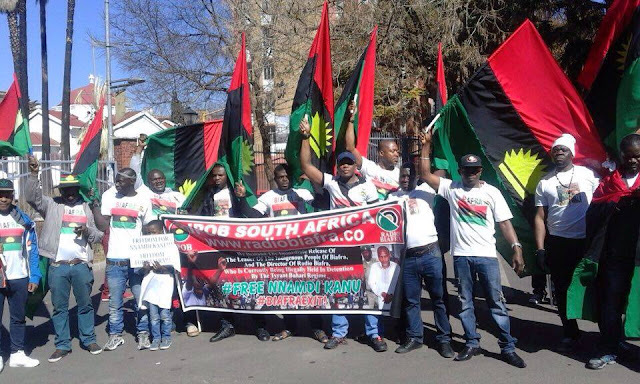 The unfolding and culmination of the vicious cycle of dehumanisation and genocide perpetrated against Biafrans is the unyielding stance of IPOB under Nnamdi Kanu, which the barbarically Nigerian security forces, scheming political jobbers (Ohanaeze Ndi Igbo) and some of the Nigerian media outlet deceitfully misrepresent as MASSOB (under Uwazuruike) whom the world have come to know as jokers under guise of freedom fighters. Raphael Uwazuruike's MASSOB has shown that they have been bought over for a paltry sum by the Nigerian state, to help quell the Biafra restoration project, which saw the Okwe genocide of 2006 swept under the carpet. To IPOB, every single Biafran life matters alot; whether it is taken out in Odi, Ikot-Abasi, Obudu, Nembe, Igbanke, Nkpor, we feel the pain. The Nigerian government ought to have understood by now that (IPOB) cannot be subdued no matter the technique employed. How the atrocities of the Buhari-led government are uunearthed by Human Rights Groups (Amnesty international and others) seem unbelivable to him and his co-conspirators. If Buhari has at anytime underestimated IPOB's resolve since the launch of his onslaught against her, which kickstarted with the kidnap of the leader of IPOB, Nnamdi Kanu and culminated into mass murder of Biafrans, it is now very certain that he did that to his folly. IPOB under Nnamdi Kanu is far from what he imagined and i dare say that he is yet to see and understand how fanatical we are when we say "Biafra or death". The international community should take a bold step further in curtailing these heinous atrocities from the Nigerian Army by placing an immediate embargo on sale of weapon to the barbarians and terrorist in uniform, the Nigerian army, under the guise of fighting Boko Haram and the Niger Delta Avengers. Nations of decent minds should come out to isolate themselves from the dying contraption and also support the Biafran sovereignty cause before the repetition of the 1967-1970 genocide. Read also: Read Also: BIAFRA: EXPOSED :- BUHARI THREATENS JUSTICE BINTA FURTIVELY TO DENY NNAMDI KANU BAIL. The killing of over 2000 armless and peaceful Biafran protesters has revealed that the Nigerian Armed Forces as presently composed is dominated by conscripted Boko Haram fighters and must be confronted with utmost seriousness. It amounts to arming an official deadliest terrorist networt after ISIS, should any morally decent state sell arm to the trigger-happy Nigerian army. IPOB is calling upon world leaders to wade into the ugly situation currently being experienced by Biafrans in a stifling union engineered by Britain. Self determination as campaigned for by the Scottish and Western Sahara whom Buhari hypocritically advocated for is what Biafrans are also agitating for. These leaders are reminded that Silence in the face of evil is greater evil itself, the earlier they condemn in entirety the unwanton killings of Biafrans by the blood thirsty tyrant (Muhammadu Buhari), the safer and better for the whole of humanity. They should support our call for a referendum so as to dampen the already tensed polity.